The Foro Italico is one of the largest architectural complexes built under Mussolini, and home to two stadiums that host Rome’s soccer teams, international sports tournaments, and concerts. An excellent example of Italian Fascist architecture, the Foro Italico is an interesting stop for architecture aficionados. 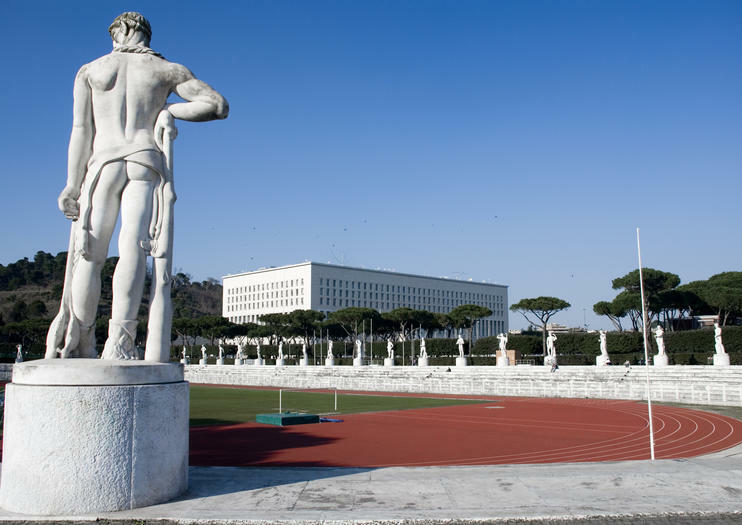 Originally called the Foro Mussolini, this sprawling sports complex was built to draw the 1944 Olympic games to Italy's capital city (the games were instead canceled due to World War II). The largest building on the site is the Olympic Stadium (Stadio Olimpico), rebuilt in 1990 to seat more than 70,000 people. The nearby Stadio dei Marmi, designed to resemble an ancient Greek stadium, is ringed by 60 marble statues of athletes and can hold 20,000 spectators. The main draws for visitors to the Foro Italico today are Lazio and Roma soccer (football) games, the Italian Open tennis tournament, rugby matches, swimming competitions, music events, and architecture tours. As the complex is outside the center of Rome, the best way to visit is on a guided tour of Rome’s Fascist architecture that includes transportation to the Foro Italico and back into central Rome. The complex is a stop on many Palermo Segway, walking, and biking tours. The Foro Italico is an outdoor complex, so wear a hat and sunscreen. When large sporting events or concerts are scheduled, only ticket holders can enter the complex. This is an especially fascinating site for architecture and 20th-century history buffs. The complex is accessible to wheelchairs and strollers. The Foro Italico Sports Complex is located on Viale del Foro Italico outside the city center. Take metro line A from Piazza del Popolo to Flaminio, and then the tram 2. The complex is outdoors, so tour on a day with clear skies and mild temperatures. During the summer, the best times to visit are in the early morning or late afternoon. Check the event schedule, as visitors who do not have tickets cannot pass the security checkpoints into the complex when large sporting events or concerts are scheduled. There are a number of architectural reminders of Italy's Fascist past in the capital city. The most important are clustered in the EUR neighborhood, home to the "Square Colosseum," but perhaps the most controversial is the Obelisco del Foro Italico, a large obelisk at the entrance to the Foro Italico that was erected to honor Mussolini in 1932. See a different side of Rome, away from the historical center full of ancient, Renaissance and baroque sights, on this tour of the EUR district. With a more recent history that dates back to just the 1930s, when it was founded by Italy’s fascist dictator, Benito Mussolini, the EUR is home to structures that symbolize Mussolini’s fascist philosophies and is nowadays a center of business in the city. With a knowledgeable guide, you’ll visit sites like Square Colosseum while learning about the history and politics behind the buildings and landmarks. Maximize your time in Palermo port with this 3-hour Segway sightseeing tour. Simply step on the electric, self-balancing Segway, and then glide behind a guide as you explore the streets of Palermo. Hop off to take photos, learn about the city’s history and see a multitude of sights. The Gallery of Modern Art, Capos Market and the Palace of the Normans are just a few Palermo landmarks on the list. Take a two-wheeled approach to exploring Palermo with this guided bike tour of downtown and the old city center. Learn about the Sicilian capital’s ancient history and modern culture as you pedal along bike-friendly boulevards and backstreets. Enjoy the flexibility to stop and soak up the energy of markets and squares while hearing the legends that make up the city’s southern Italian soul.